I spent a large part of Friday (22-Nov-13) doing what I like best – making things. Based on our experience with the trial Jane has been re-thinking our training materials for the scale-up (KYTS). We envisaged that the training materials developed for COTZ would be used for retailer and promoter training and then cascaded down to mothers and care-givers. Although the materials were used at the top level they tended not to be used by retailers and promoters with mothers and instead a much more conversational approach was taken. This worked well but it meant that the quality varied and we can’t be sure that all the key points were covered on every occasion. In the scale-up we will continue using the existing materials for the top level training but promoters and retailers will take away ‘flash cards’ containing the key messages to cascade to mothers and care-givers. 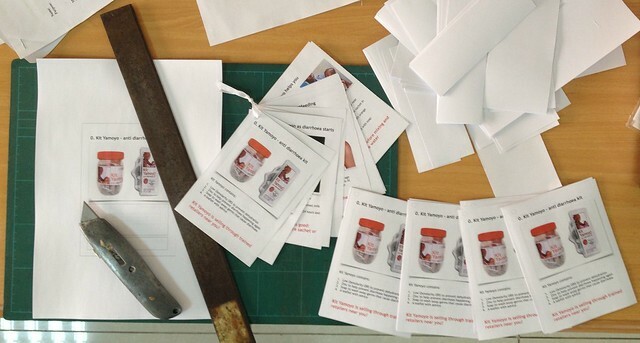 The picture shows prototype cards on paper which we will send to Zambia’s Ministry of Health for comment and approval. Once approved we will print the first batch – for fast prototyping – on to card using MOO Postcards. MOO allow full colour printing on both sides which is just what we need to cope with the translation issues we face. There are six main languages in Zambia: English and five others. Jane‘s idea is that each card will have a key message printed on one side in English and the other side will have spaces for this to be translated into a local language. This will be done, by the trainee, during the training to reinforce the learning – with the terms used moderated by the trainer to make sure the sense is conveyed properly and consistently. And it will mean we don’t need to have 6 different sets of cards printed. As an example, the two sides of the first card are shown below. The full set of prototype cards can be downloaded here (PDF 1.7 MB). These are still at draft stage so any feedback would be gratefully received. 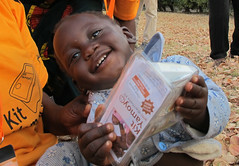 I volunteer for a small charity working in Monze, Southern Province of Zambia. Please can you let me know if Colalife will be available in the town and where it will be available. 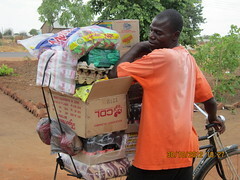 My partners in Monze are interested in getting supplies. 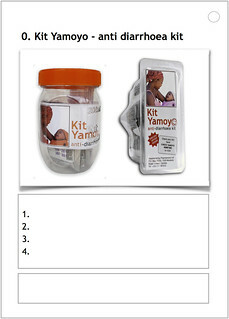 We plan to have the kits available in Monze from Apr-14. We are not sure of the wholesalers and retailers we use yet. Who are your partners in Monze? Keep an eye of this blog for announcements. It’s great to hear that you are making real progress with the next stage of transition. I liked the cards but was surprised by the complexity of some of the language – eg low osmolarity – but you and Jane will have taken a view on that already. The other thing that I wondered about was the opportunity to do a bit of behavioural ‘nudging’ in the training. For example, telling mothers some of the facts and insights from the trial could help improve take up rates. 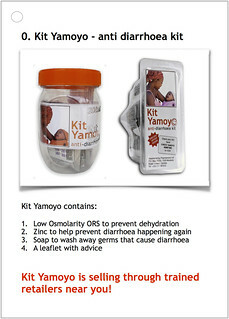 There is a lot of evidence to show the effectiveness of this type of intervention, which you may already be familiar with: eg a simple message to say x% of mothers who tried the kit said it was easy to use and y% said their children liked the taste of the ORS drink. If you’d like any further ideas or input on these ‘nudging’ (behavioural economics) interventions, do let me know. There may also be similar interventions that could improve the effectiveness of retailing and product presentation in retailing outlets. Thanks for you comment Colin. On low osmolarity, that’s the language the Ministry of Health want used so we are going with that. However, we love to know more on the behavioural economics front. Comment on the cards – there is an error on card 7 – the word ‘at’ – you have probably seen this already. Has no energy or is lethargic – the word lethargic means ‘has no energy’ so the word seems redundant and will probably just be translated as ‘has no energy’ , what about ‘does not respond ; or ‘does not react’ or ‘is limp’. Exciting that you are scaling up. Seeing those pics makes me realise how valuable it is. All looks great, otherwise – illustrations are very clear. Thanks for taking the trouble to go through the cards J. Very helpful. We will be making the changes you suggest.